The paperwork requirement — though recently extended from the original September 30 deadline to allow more accurate data collection — is upsetting parents and advocates for poor children, who say it imposes a burden on kids living in cities with a high cost of living like Oakland. Tina Jung, an information officer for the Department of Education, reiterated that signing an application is necessary to receive appropriate funding. “It’s important for us to get the most accurate information so that the schools will get all of the funding needed from LCFF,” she said. Under LCFF students may only receive funding for one category, for example, being a foster child or an English learner. “A lot of schools used aggregate data that was sometimes ten years old,” said Jung. Filling out applications allows the schools to form up-to-date information about the student body and to provide for them appropriately. As the February 6 application deadline approaches, the school district is on a full-throttle campaign to increase awareness of the new statewide requirements. OUSD is currently distributing fliers and running ads on local TV channels urging parents to heed the deadline, as the majority of at-need students have not yet submitted applications. The school district receives $3.44 for each free lunch and $3.04 for every reduced lunch in state and federal reimbursements. Loss of such support would be costly, school officials say. “For every 1% that we’re off our goal … (it) costs the district $200,000,” OUSD spokesperson Troy Flint said. If sufficient applications are not filled out this year for next year’s budget, the money for meals will come out of the district’s general fund that would have been used for equipment for classes, extracurricular activities or other needs. In previous years, 70% of the student population qualified for a free and reduced lunch. This year OUSD is striving to have 80% of the students return applications. OUSD has long been praised for its progressive efforts to provide nutritious meals to its students. Flint said that healthy and well-balanced meals for children would not be compromised even if the school district does not receive enough funding for next year’s lunch budget. OUSD is planning on converting a lot that currently holds a Foster Mortgage building in West Oakland into a district farm over the next five years. In prior years, Provision 2 schools, schools where low-income children made up 85% of the school population, automatically received free and reduced lunches. However, students in non-Provision 2 schools, schools where low-income students made up less than 85%, were required to fill out an application. As of the 2012-2013 school year, federal nutrition programs require independent applications from children in Provision 2 schools as well. This change in requirements raises questions about the federal nutrition programs’ nationwide standard of household income. For years, federal nutrition programs have based the free and reduced lunch program on a single definition of low-income. Under that definition, children are eligible if their family income equals 130% of the federal poverty level. 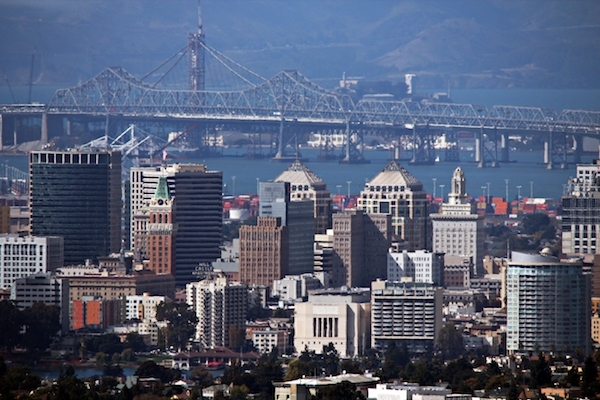 The national standard overlooks children in need who are living in areas such as Oakland, which has a high cost of living, critics say. According to the Council for Community and Economic Research, Oakland is one of the 10 most expensive cities in California. Requiring that all students in OUSD who are eligible for free and reduced lunches fill out an application reflects a failure to factor in variable costs of living , according to a state legislator whose district includes Oakland. To counteract the disenfranchisement of at-need children, California State Assembly member Nancy Skinner, who represents the 14th District including the East Bay, proposed Joint Resolution 31 to urge the U. S. Congress to reconsider the eligibility requirements of low-income families in Oakland. “The failure to recognize local costs of living is an issue of equity affecting California’s children, especially those in high cost regions like the Bay Area,” Skinner said in a statement made August 26th. “Many students in California are being short-changed because the threshold for determining free and reduced lunch doesn’t consider students living in high cost-of-living states,” said OUSD spokesperson Flint, adding that nationwide requirements were not based on the needs of children in Oakland. Confused and angered parents earlier created a Facebook page, which has since been taken down, that included the rumor that the federal government was cutting out the free and reduced lunch program completely. Many parents with children in OUSD were also concerned that families who aren’t citizens might be exposed to scrutiny, and that a reduction in funding would leave their children hungry. Mary Prime-Lawrence has three children attending Oakland charter schools who qualify for the free and reduced lunch program. She worries that parents who fear exposure or who don’t have citizenship status might be deterred from signing an application for the program. Flint reassured parents that Social Security numbers wouldn’t be used on the applications, and that the information wouldn’t be shared with other governmental agencies. Flint also quelled parents’ concerns that this year’s free and reduced lunch program would be cut if parents did not submit the applications by the deadline. “The way the funding mechanism works is that the funds are determined by the previous year, so the applications that will be received for this year will affect next year,” he said. But make sure you are vigilant when finding the best SEO services UK. made to fit into the exact requirements of your business. regarding this article. I desire too learn more issues about it! feature during the winter months. You can enjoy your holiday according to your budget.